For many watchers of political races, it’s a numbers game. Dr. David Sathiaraj, Assistant Professor for Research in Geography and Anthropology at LSU, thinks there’s a better way to crack those numbers. Traditional polling is good, says Sathiaraj," but in some cases, traditional polling can tend to be particularly small sample sizes, and so they may not be representative of the electorate." Traditional polling is typically done by selecting a group of people, asking them questions - like who they plan on voting for - and using that as an indicator of what the entire electorate may do. Sathiaraj wanted to dig deeper. His goal was to capture individual’s feelings of a candidate or an issue. He developed an algorithm that would pull information like voting history, voter registration and polling results. "The algorithm basically provides scores for people on how they perceive a certain candidate or an issue. You’re able to come up with a more realistic scenario as compared to a broad, statewide poll," he says. Sathiaraj believes campaigns big or small can use his algorithm to better pinpoint who they should reach out to. By enabling campaigns to see if they're weak in areas like a parish or precinct, says Sathiaraj, "they can start targeting, canvassing, getting the message out in those areas." That individualized approach leads to a smaller margin of error. Sathiaraj used the algorithm on last year’s senate runoff election in Louisiana. His model was nearly spot-on, just .2 percent off the actual results. 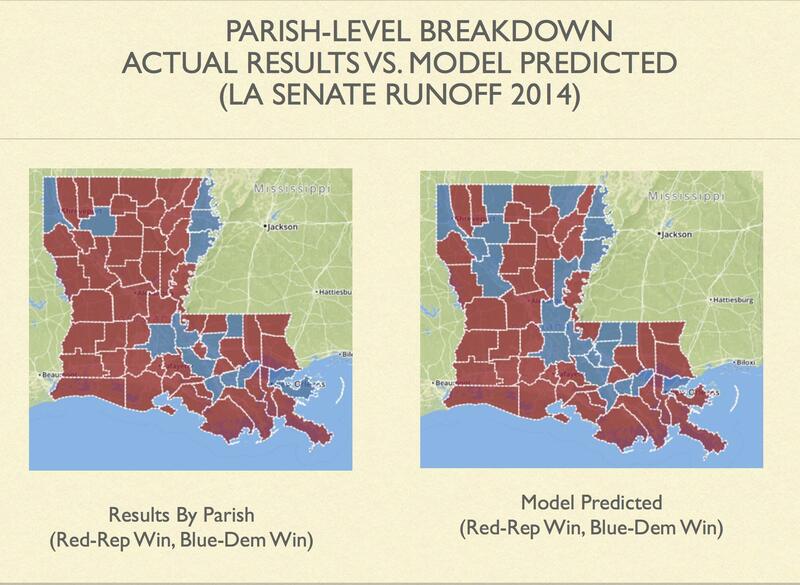 The algorithm correctly predicted how fifty-seven of the sixty-four parishes would vote. On average, most election polls have a margin of error of three to four percent. Sathiaraj thinks that granular approach helps. "Polls are much broader, done at a statewide level, and the sample can be randomly selected. You may miss out on certain parishes that may be swaying one way or another. Because it’s so broad-based, a sample size of eight hundred is typically too small for an electorate that’s about three million," he explains. The next step for Sathiaraj and his team is to scale the new technology to test on larger voting populations. Three polls conducted since the October 24th primary show Democrat John Bel Edwards continuing to lead Republican David Vitter in the contest for governor. Edwards received 40-percent to Vitter’s 23-percent of the primary vote, and leads by a margin of anywhere from eight to 20 percent for the runoff, according to those polls. But are the polls merely reflective of voter leanings, or do the polls somehow influence how people vote? “Under certain conditions, the polls can have an influence,” according to LSU political science professor Robert Hogan. Early voting for the November 21st runoff continues through Saturday, and Secretary of State Tom Schedler is not yet ready to predict whether voter turnout will exceed last month’s primary. “You know, this science is not becoming any easier,” Schedler says, with a chuckle. Turnout for the October 24th primary election was anything but amusing, at a dismal 38.5 percent.